JEFFERSON CITY, Mo. — A new report issued by the House Special Investigative Committee on Oversight outlines the committee’s investigation into Gov. Eric Greitens and his use of a donor list from his former charity, The Mission Continues. According to the report, Greitens lied to the Missouri Ethics Commission about taking the donor list and using it to raise campaign funds. But the House report issued on Wednesday afternoon contradicts that, indicating that not only was his campaign working with the list but that Greitens and his campaign lied in their campaign filings and violated campaign finance laws. 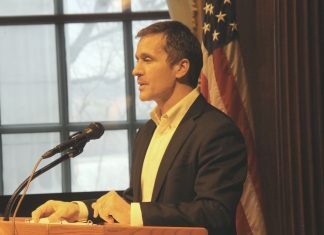 The report details that Greitens’ former campaign manager, Danny Laub, did not give the campaign The Mission Continues donor list, contradicting the settlement agreement that Greitens had signed in 2017 when he admitted to the wrongdoing. Laub told the Missouri Attorney General’s Office that the governor had knowingly lied to the ethics commission about how he came into possession of the donor list, saying that he had been tricked by the Governor’s political advisers, “affirmatively misled by campaign manager Austin Chambers, to take the blame. He said Chambers convinced him to put his name on the settlement, but that he had no idea his name would be put on the report and that he would be blamed for providing the donor list. The evidence shows that the Governor actually received the donor list himself from an employee of The Mission Continues, Lori Stevens on May 8, 2014, which they had understood to be for the purpose of calling key supporters and explaining that he was stepping down as CEO. Furthermore, the committee’s findings reveal that Greitens had signed a nondisclosure agreement with The Mission Continues, dated November 27, 2012, agreeing to hold in strict confidence “the identities of any donors or investors, and any personal information of donors or investors, and any contact information for donors or investors,” as well as any “lists, databases … trade or business secrets, … and similar or dissimilar information relating to the operations or activities of TMC. The agreement stated that Greitens would not disclose any confidential information with any third party, and that the “intellectual property” developed by himself belongs to The Mission Continues and could not be used by him unless he had received written consent from the organization. The Mission Continues president, Spencer Kympton, testified that the donor list was covered by that nondisclosure agreement. The report also shows that Greitens had considered running for office as early as October 2013, though his campaign committee wasn’t formed until 2015. The report indicates that Greitens paid advisers personally and through The Greitens Group, though statewide office candidates are required to register a campaign committee with the MEC after they have spent $500 or more. Following the release of the report, Democrats in the House renewed their calls for Greitens’ resignation or impeachment.